Its finally happened. At the start of September we take over Unit C4 alongside our existing premises, Unit C3, more than doubling our workspace. It seems like an age since we took on the first unit back at the beginning of 2013 and for a while it seemed so bare. Now its jammed to the gunnels with all manner of tools, materials, chemicals (all eco-friendly I hasten to add) and of course a pucker sound system. 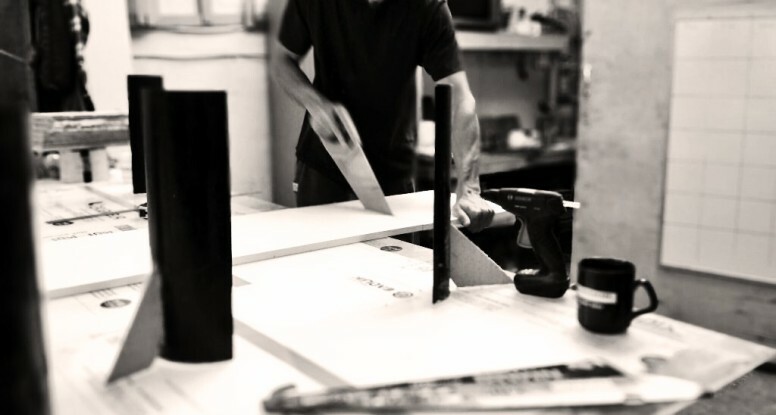 At any one time we may have moulds being built, products being cast, concrete curing, worktops being polished, sealers being applied and “stuff” being readied to ship. We’re itching to get in now too. We’ve had numerous meetings about how we’re going to organize the space, which tools will go where, can we squeeze in a gym, photography studio and shower! We’ve drawn lots of pretty drawings of the layout all nicely colour-coded. So the next time you’re passing, local or not, bang on the door and come and have a nose. From the 1st of September you’ll have two doors you can knock!